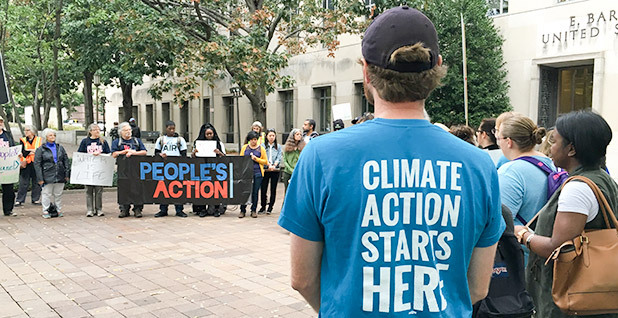 Protesters rallied outside the U.S. Court of Appeals for the District of Columbia Circuit early yesterday as judges prepared to hear arguments on the Clean Power Plan. Photo by Erika Bolstad. Many thought the agency and supporters of the Clean Power Plan had an edge during the nearly seven hours of oral arguments at the U.S. Court of Appeals for the District of Columbia Circuit. It quickly became apparent, though, that the agency's biggest legal hurdle may come from its attempts to make the standards for power plants more flexible, affordable and ambitious. The most contentious questions focused on a big issue: how the regulation set state-specific carbon levels for power plants. Rather than looking at what individual coal plants could do to limit greenhouse gas emissions, EPA assumed the industry as a whole could accelerate a trend away from coal and toward cleaner natural gas and renewable power. Lawyers for the 27 states and an army of mostly coal-reliant companies opposing the rule argued that EPA overstepped its authority under the Clean Air Act, moving into Congress' turf and violating a separation of powers. Judge Brett Kavanaugh, a George W. Bush appointee, said that while curbing greenhouse gas emissions that humans contribute to climate change is a "laudable" goal, "global warming isn't a blank check" for the president. "I understand the frustration with Congress," he added. But he said the rule is "fundamentally transforming an industry," in place of legislators. West Virginia Attorney General Patrick Morrisey, a Republican who is challenging the rule, said after court that the way EPA set goals is key to the case. "We've always felt that's a very compelling argument, and while we feel that all our arguments were strong, that argument did seem to resonate with a number of people," Morrisey said. EPA defender and Justice Department attorney Eric Hostetler, on the other hand, argued that the rule sets standard emissions levels for plants and lets states decide how to meet them. He said an aggressive transition is already underway in the power sector, and "this rule just deepens the trends." Global warming isn't a blank check. Eighteen states and a slew of business interests have sided with EPA. Hundreds piled into the courtroom and overflow rooms yesterday, including EPA chief Gina McCarthy, general counsel Avi Garbow, air chief Janet McCabe and air attorney Joe Goffman, as well as White House energy officials Brian Deese and Dan Utech. Yesterday's arguments played out against a backdrop of intense domestic political drama as well as enormous international pressure to tackle climate change. Just last week, more than 30 countries at the United Nations ratified the Paris Agreement to keep global average temperatures from rising to catastrophic levels, and it is expected to enter into force this year. The Clean Power Plan is the linchpin of America's contribution to the deal. Meanwhile, Republican presidential nominee Donald Trump has vowed to "cancel" the Paris deal and eliminate the Clean Power Plan if he is elected. Yet while the case is under close scrutiny at home and abroad, a D.C. Circuit decision might not come until early next year, and a final call from the Supreme Court could take until 2018. Meanwhile, the rule could stay on hold under a Supreme Court order from February. Challengers are bringing a range of charges against the rule, but the core fight is over whether EPA is using its congressionally mandated authority or trying to legislate massive industry changes through regulation. 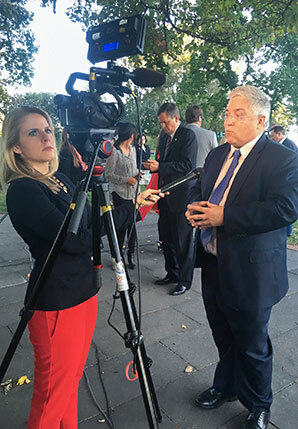 West Virginia Attorney General Patrick Morrisey (R) talked to a home-state reporter after the Clean Power Plan oral arguments in D.C. yesterday. Photo by Emily Holden. In the opening minutes yesterday, several judges suggested that in following an existing power-sector shift, the regulation wouldn't be transformative at all. Judge Sri Srinivasan, an Obama appointee, said the rule would cut coal use in the United States by a small percentage. Coal is already in decline and has been struggling to compete against lower-cost natural gas. Judge Thomas Griffith, a George W. Bush appointee, similarly noted that EPA is following an existing industry shift, although he also suggested the debate should be playing out in the Senate instead. Judge David Tatel, a Clinton appointee, said "the only thing that seems transformative here is that it's regulating CO2 for the first time." EPA is also required by an earlier court case, Massachusetts v. EPA, to regulate carbon dioxide emissions, Tatel added. 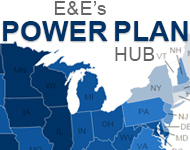 Consulting group ClearView Energy Partners suggested that if EPA wins, it may be by a partisan 6-4 margin, giving challengers more leverage to get the Supreme Court to look at an appeal. Judges may want EPA to rewrite some parts of the program, but opponents probably didn't convince them to vacate the rule entirely, ClearView said. That means the rule could be on hold through mid-2018, although "court rulings can be unpredictable," they said. Although EPA brass were at the arguments, the agency didn't issue a statement. But White House spokesman Josh Earnest yesterday morning said the administration is confident that the rule is on strong ground, legally and technically. "The president is convinced that this is a policy that is important to living up to the commitments that we've made in the context of cutting carbon pollution in a way that will be good for the long-term health of the planet," he said, adding that President Obama is convinced the rule would be good for the economy by creating clean energy jobs. 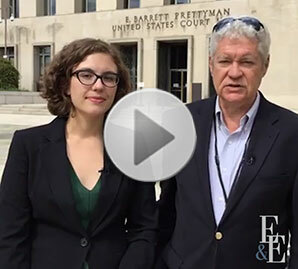 E&E's Emily Holden and Rod Kuckro provide a Clean Power Plan argument update. Click here to watch the video clip. Image by E&E. EPA seemed to excel in other arguments yesterday, including against challenges that the agency is "commandeering" states to force them to take certain actions, that the final rule was so different from the draft rule that it violated the Administrative Procedure Act and that the standards would be impossible for states to achieve. During one long section of discussion, challenging lawyers argued that EPA cannot regulate carbon emissions from power plants because it has already restricted mercury emissions from power plants under a different section of law. In a head-spinning back-and-forth, judges tried to establish the intent of conflicting amendments to the Clean Air Act that Congress passed in 1990. Depending on interpretation, the amendments might prevent EPA from double-regulating coal plants, opponents have said. Kyle Danish of Van Ness Feldman LLP said that issue didn't seem to gain much traction. "It didn't seem like the panel solidified around one particular view that would be helpful for the petitioners on that," he said. But he added that the questions judges ask during oral arguments don't always track with the decisions they render later. "Sometimes they're trying out arguments that they don't follow but would like to hear a response to," he said. Challenging lawyers also suggested that a carbon trading system, in which companies that don't reach their goals could purchase allowances from those that do, might never materialize. Kavanaugh noted that several EPA regulations and state efforts have successfully used similar trading programs, although they might not be a "perfect fit." He said that if trading doesn't work out, states could work with EPA to figure out a solution.